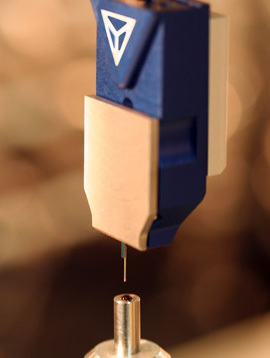 The stylus of the Heimen probe can be replaced within seconds to allow the use of different tip diameters. The above picture shows the Heimen replaceable next to the Gannen XP probe chip. Machining centers today can produce objects with uncertainties far below a micron. Aligning objects, conducting measurements during machining and post-production quality control (via for example a CMM) need to be conducted with this same uncertainty. Furthermore, due to the size of features and objects in micro manufacturing, it is important to measure with spheres as small as possible. To comply with these requirements, ultra precision (UP) probes have been developed. UP probes can reach 3D uncertainties down to tens of nanometers, e.g. the Gannen XP. Due to the working principle and low moving masses, probing forces can be as low as 0,01mN. When you combine a probe like this with a ‘nano CMM’ it is possible to perform ultra accurate dimensional measurements. Regular scanning probes are less expensive than their ultra precision counterparts and have advanced a lot in the last 5 years. However, they haven’t completely followed the ongoing trend of accuracy in production and quality control. While scanning an object with other probes uncertainties often are at micron level. Furthermore, delicate objects need to be probed with forces as low as possible. Especially in the z-direction, regular probes can have probing forces of about 10 kN/m. Probing with these forces will not only damage the work piece, but it will also make the measurement redundant. To fill the obvious gap between UP and regular probes, Xpress PE offers the Heimen Series. Due to the innovative design of the silicon chip it is robust and less expensive to produce. Assembly of the stylus onto the chip is less demanding and can partially be automated. This increase in robustness leads to a less sensitive chip with a slightly worse uncertainty compared to UP probes. However, for most applications the 0.27 micron 3D uncertainty (k=2) will do perfectly. Just like UP probes, the Heimen has a low moving mass (<25mg), which makes it possible to conduct measurements with micro sized spheres without damaging the object. Depending on the application, a 2D or 3D chip version can be used. A user friendly click-on system makes changing of styli, spheres and switching between 2D/3D a matter of seconds. Since many machining centers and multi sensor CMMs have limited space for (additional) probes, the Heimen Series is designed with a footprint of only 5x22mm, making it one of the smallest scanning probes in the industry. 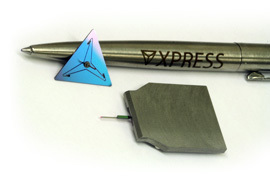 The core principle of the probes from Xpress consists of a silicon chip. The moving part of this chip is connected to the fixed world by three slender rods. These rods have integrated piezo resistive elements. A stylus with sphere is assembled onto the moving part. When the sphere contacts the surface of an object, the three rods change in shape. Combining the changes in all three rods in a matrix multiplication, the exact position of the tip is calculated. The Gannen Series uses a stylus which is perpendicularly assembled on the moving part. Contrary to the Gannen, the styli of the Heimen Series are assembled in the plane of the chip. The name Heimen has Japanese roots, just as the Gannen Series. It can be translated as level surface or plane, which refers to the patented working principle of the probe. The moving and measuring parts of the chips are located in such a way that movement of the sphere is detected in three directions.